The registration and abstract submissions will be processed by ConfTool. With click on the "Register"-Button you will be redirected to our ConfTool registration mask. Access to all conference activities is subject to registration. Participants are encouraged to register as early as possible in order to benefit from lower registration fees. Please use the same e-mail address when registering as a participant and when submitting an abstract. • Attendance at the welcome reception on Monday. All authors of accepted contributions to EBS2017 in Potsdam are invited to submit a manuscript with their new exceptional research focussing on analytical and bioanalytical innovations to the journal Analytical and Bioanalytical Chemistry (www.springer.com/abc). Manuscripts can be full Research Papers or Rapid Communications, presenting original, unpublished work on new analytical method developments or innovative analytical applications to be in agreement with the journal’s aims and scope. The Editors would like to point out that according to the editorial policy each submitted paper is subject to customary peer-review procedures and will be prescreened by the Editors first. Criteria for acceptance of a contribution include receipt of two positive referee reports by renowned experts of the respective field. - For a full Research Paper, paper length must be appropriate to content. There is no strict page limit, but ABC advises a maximum length of up to 6 000 words including 20-30 references, plus 4-6 figures and 1-3 tables. - Rapid Communications are urgent communications of important preliminary results that are very original, of high interest and likely to have a significant impact on the analytical community. A Rapid Communication needs only to demonstrate a ‘proof of principle’. Yet, fragmentation of a substantial body of work into a number of short publications is strongly discouraged and is a valid reason for rejection. For a Rapid Communication we advise a length of 3000 words, plus 2 figures and/or tables, and 15 key references. Please submit your paper online directly to the ABC editorial office at http://mc.manuscriptcentral.com/abc, preferably till September 1, 2017. BioSensor Symposium, Potsdam, 2017.). 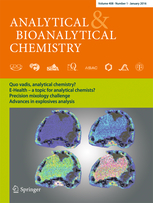 ABC is pleased to announce that each author team will be provided with a free e-offprint (PDF including attractive cover sheet) of their published article and that color figures are free of charge. We are delighted to announce that the Tenth German Biosensor Symposium (10th DBS) comes back to Potsdam and will also host the First European Biosensor Symposium (1st EBS).